If Puppies Had Second Amendment Remedies | Will My Dog Hate Me? 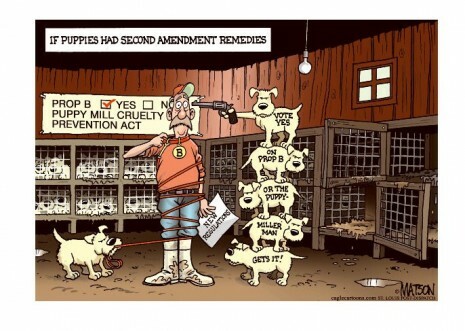 If there were two topics that I didn’t think could turn up — much less together — in a cartoon that would make me smile, it would be the Second Amendment and puppy mills. I love being pleasantly surprised. I particularly like the expressions on the faces of the hostage-taker pups. I’m very glad the Missouri Law against puppy mills passed — this was published the day before the election — but I don’t think the puppy miller man should be released. I’d prefer to see him stashed away in a very small prison cage. This is a great law. I really hope it inspires other states, and maybe Canadian provinces, to pass similar forms of legislation. It’s a strong step in the right direction anyway. Very, very, very small. And stacked upon other cages containing other puppy millers. Hollywood has banned selling puppies in pet shops, it would be great if the rest of California would follow suit. Love the cartoon! great cartoon indeed! glad to hear the law was passed. i read somewhere that there are petshops in america where, instead of selling puppy mill pups, they sell rescue dogs/pups instead. that is such a fantastic idea and i’m hoping that one day, all petshops will be as enlightened. of course, NOT selling live animals in petshops would probably be the best! Glad you liked the cartoon, Georgia. You’re half right about the pet shops in America and rescue dogs. There are shops — two of them right here in Tucson — that serve as an outreach for the shelters. They look like regular pet boutiques and they sell pet products but they *don’t* sell dogs (except if you want to count the usual licensing/adoption fees). They’re a great way for people to see pets that are up for adoption outside of the usual shelter environment. And it’s a great way for the shelter dogs and (to a lesser extent, cats) to get out of the shelter and interact with people. are these “shops” more like “branches” of the shelters then, rather than commercial entities on their own? I have a friend who’s looking for a pup and it’s hard work persuading her to try a rescue. if there were more of these “shops” around the city, i guess more people might be persuaded to have a look since they wouldn’t have to go all the way out to some faraway “depressing pound”. Yes, they are branches or outreach centers of the shelter. The animals go back to the shelter at night and all the profits from whatever is sold in the shop go to the shelter. Both of the shops in Tucson are in malls, one of them very upscale, so I think that gives people the sense that the cats and dogs are more valuable too! 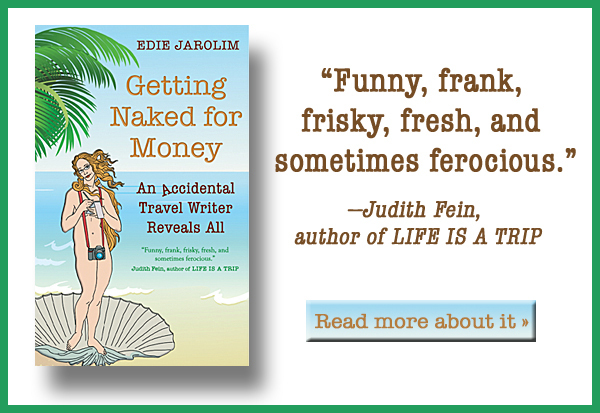 Edie, you are the researcher par excellence, extraordinaire, and every other superlative you can think of. Great cartoon! Do onto others as you would want them do onto you. I think it would be only fair to reverse this. I agree with you Edie – stash them away in a prison! My tolerance level is low to none for people that do things like this. I worked with a humane investigator in Virginia for a while. She was on 20/20 about 15 years ago, I think, because she was instrumental in closing down some puppy mills. It amazes me that it has been this long, there has been media exposure and still, it goes on. Some things in life should just be obvious but sadly, they aren’t. I wish this law was on the federal level but need to be thankful for what you can get I guess.